This December there was such an outcry about the municipality’s plans to spend 200,000 euros on decorating Athens for Christmas, that the Mayor backed down and hired school children to do the job. Instead of installing the “tallest tree in Europe” – an earlier mayor’s boast – in Constitution Square, city officials made do with the trees already in place. Instead of the previous years’ “village” of Austrian-looking “cottages” selling sweets and trinkets for children filling the middle of the square, the big open area looked like it does on a normal day. Though normal – plain cement plaques and fountains uncluttered by the tents of Indignados or protest banners – is becoming more and more unusual. When I finally made time to go down to the center yesterday, Athens was on her best behavior but hardly wearing her gladrags. The day sparkled, as it often does this time of year, so even without tinsel and lights, the city looked bright. 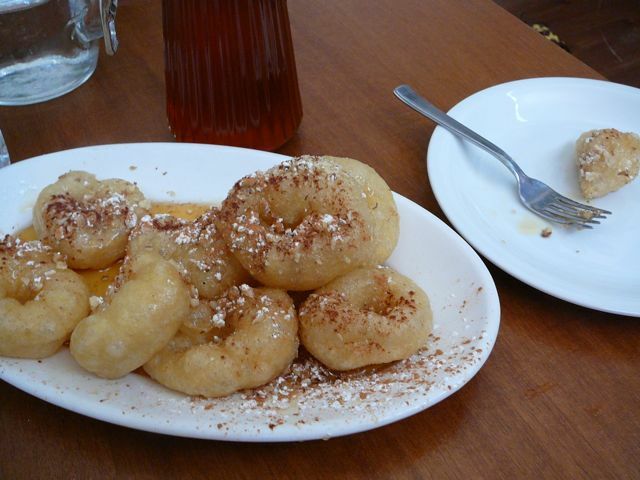 And pleasantly crowded with people of all ages, many of them munching on sesame rings – a standard Greek/Turkish snack. I was tempted but did not give in. And the friend I was meeting did not offer me her last bite. Instead we admired the bitter orange trees. You can find these on many an Athenian street, their blossoms pouring sweet perfume in the spring, their fruit deceptively alluring this time of year. Remarkably, the trees are still full – lately, bitter oranges have provided ready ammunition against the riot police. 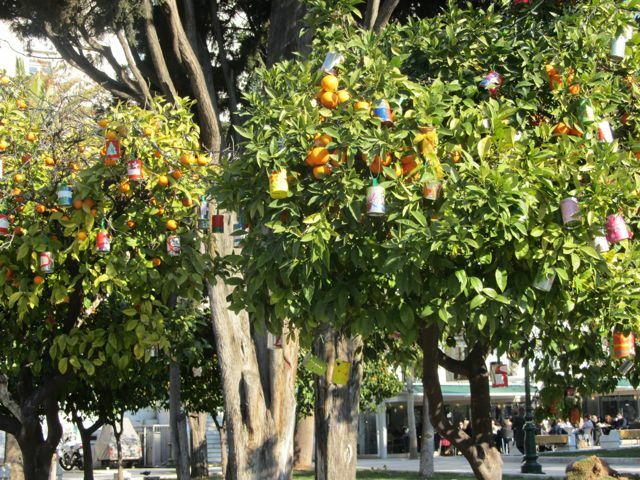 And in addition to the oranges, the trees are sporting decorated tin cans, spangling silver, red, blue with Santas and stars, against the green leaves. School kids designed them, without remuneration. We ambled down Ermou Street without seeing a single closed shop. This is Athens’ main shopping drag; there are boarded store fronts aplenty everywhere else. We passed the chocolate souk, the shoe souk, the fabric souk, and the florists’ souk before reaching Athinas Street, which is a mishmash of hardware stores, bakeries, specialty food shops, posh banks, and even a tack and harness boutique on the stretch between Monastiraki and the Central Market. This last, with its Camargue and Western saddles, wide range of sheepbells, shepherds’ crooks, and bridles studded with blue and white evil eyes, raised questions. Who were its customers? This district is one of my favorite parts of Athens. It still maintains its Anatolian flavor combined with a Hellenic liveliness and is a comforting mix of stylish revamped neoclassical buildings, Byzantine and 19th century churches, funky cafes, and derelict facades. 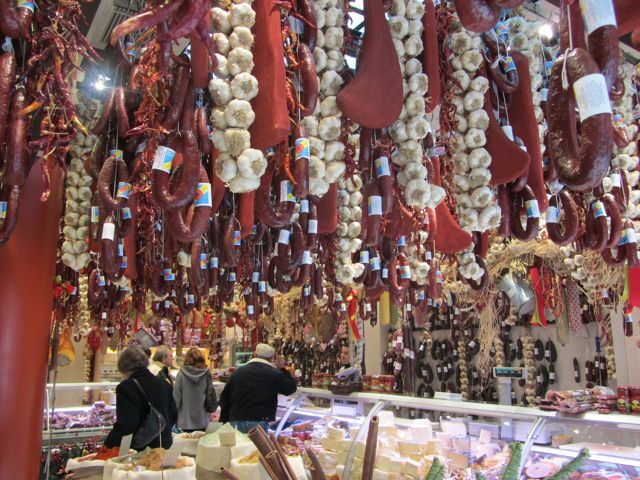 We sniffed the aromas from the spice emporia and the pastourma/preserved meat palaces on Evripidou, pored over the knives, spatulas, and kitchen paraphernalia in a shop for cooks and, resisting the urge to enter the Market, walked up to the Byzantine church of Sts. Theodore (there are always two of them), on to Praxitelous with its bead souks, and into a very special place for a timely lunch. We were both suffering from hypoglycemia and museum back as we sank into the old-fashioned wooden seats at Doris, an Athens institution. Here both famous and undistinguished sit at marble-topped tables and feast on homey Greek dishes cooked far better than almost anyone’s mother could produce. Not for the steak and fries aficionados, Doris specializes in classics like moussaka and fish soup, stuffed cabbage rolls or stuffed eggplant. We decided on spinach with cuttlefish stew and lahanorizo/cabbage risotto, which stopped us from speaking as our tummies stopped complaining. But the real reason for going to Doris is the plate of just-fried loukoumades/doughnut holes drizzled with honey and cinnamon. If you order them after lunch, you’re offered them free. Sated by now, we waddled back to Constitution Square. And would have descended into the Metro were it not for a big crowd blocking the entrance. 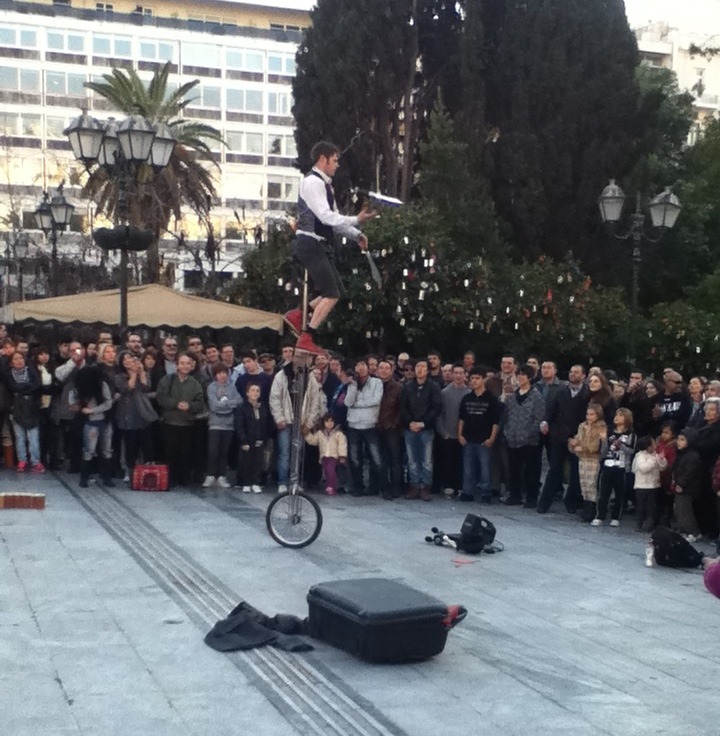 Hundreds of people – young, old, Greeks, tourists (yes, there were even a few Asians) – had formed a square within the Square to watch a juggler with chutzpah. Using four or five mispronounced Greek words, a 30-ish Canadian was stopping Athenians in their tracks. He had banter and humor; he could keep torches flying and blow them out without missing a beat; he could sit atop a 10-foot unicycle, tossing wicked looking scimitars; and best of all, he could tease the determined non-spectators who grimly crossed his territory without a pause. At the end, having performed an “impossible” hat trick, he pleaded with us all to drop in one, two, or “the usual” five euros. I didn’t see any notes flying into his capello, but just about everyone left a coin or two. Though his was but a tiny circus, this wandering performer kept his audience entertained. Lifted them out of themselves and their problems for a while and set them down gently on their way. PS Doris was listed in the NY Times last January as one of the best eateries in Athens. I’m happy to say nothing has changed since then. You’ll find it at Praxitelous 30, Athens; (30-210) 3232671. This entry was posted in Uncategorized by Diana Farr Louis. Bookmark the permalink. What a lovely post, Diana. Your storytelling and writing are magical. I should like to “waddle” through these places with you one day soon! Thank you. Thanks so much, Alexia. You led the way, inspiring me. Let’s waddle together soon, that will be fun! I too am a great fan of the centre of Athens and frequent it and the small shops and businesses as much as possible to encourage them to keep going in these difficult times. I really enjoyed your post. Hi, wish you could have been with us last week. Thanks, Christine. Maybe we can do it again next week. Polly, you say the most wonderful things. Your comments inspire ME! I’ll try to live up to them.